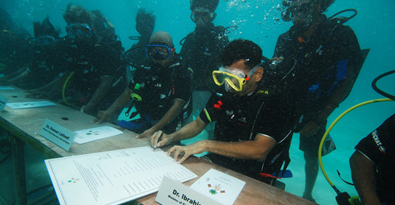 10.30 am: Worldâ€™s first ever underwater cabinet meeting just concluded in the Maldives. The cabinet meeting was chaired by President Mohamed Nasheed. In the meeting, the President, Vice President, and the cabinet signed a declaration calling for concerted global action on climate change, ahead of the UN climate conference in Copenhagen. The underwater meeting was part of a wider campaign by international environmental NGO 350.org. After the underwater cabinet meeting, the cabinet, including the President, will hold a press conference. They will also participate in a bicycle ride in the capital Male later in the day.